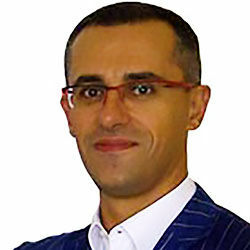 Dr. Razvan Popescu is the Business Unit Head of the Textile Chemicals division of Bozzetto Group. He is a Masters in Organic Chemistry from Bucharest University in Romania and joined Bozzetto Group way back in 1996. Bozzetto Group, founded in 1919 and headquartered in Italy has a strong heritage and customer oriented focus. In the textiles business, it offers products for all segments of textile processing – fiber finishes, sizing, preparation, dyeing, finishing, technical coating & laminating, garment processing and leather. It is a privately owned, innovative, specialty chemical manufacturer with operations in numerous locations serving the major textile markets of the world - Europe, Asia, North and South America, and the Middle East. Last but not the least; Bozzetto Group is fully committed to ecology, environmental responsibility and stewardship, and sustainability. TT: Bozzetto offers spin finishes. What is it exactly and its end use? Do you supply these fibres to nonwoven fabric producers and if yes, to produce which nonwoven fabric? A spin finish is an application to man-made fibers of surfactants, lubricants, cohesion agents and other additives as solution or emulsion for facilitating the primary or secondary spinning process. In fiber production, a distinction is drawn between filament yarn and staple fiber finish. Indeed we do supply products to the nonwoven industry. We produce products for the hygienic, automotive, geotech and other end-uses for different application and requirements e.g. hydrophilic spin finish for hygiene staple fibers; spin finishes designed for applications where a smooth handle is required etc. This is only a very small example of our wide range of products. TT: For what applications or end-uses in technical textiles are technical coating and lamination products produced by Bozzetto applied? The Bozzetto Technical Coating and Laminating (TCL) department offers a wide range of products for most of the application fields within the Technical textile business. Our main areas of application are Mobiltech, Clothtech, Sporttech, Protech, Hometech. The products we are offering are Thermoplastic / Hot melts resins, additives for the same, Polymer Dispersions and the needed Additives as well as Flame Retardants, Fluor Carbon chemicals and special customized compounds for a wide range of applications. TT: Please share any ongoing R&D activities at Bozzetto in relation to coatings or laminations for applications in technical textiles? There are several R&D projects running in the TCL department. For instance in the Hometech sector, we are working on reducing lambda value for insulation of roofs and walls. In the Mobiltech sector, we are working on protective fabrics made from nonwoven and in Protech sector, we are working on permanent antibacterial systems. On the other hand, we regularly organize workshops with our customers on our state-of-the-art pilot plants in Germany to solve problems or create new technologies and products.